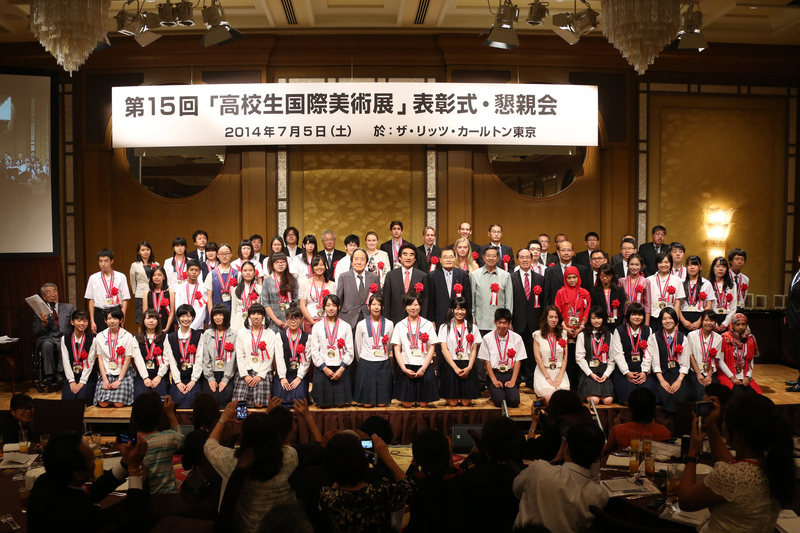 Japanese and foreign high school students had the honor of winning prestigious awards at a ceremony for the 15th International High School Arts Festival at a Tokyo hotel July 5. The festival represents one of the largest international art exhibitions for high school students. This year, students from Japan and 13 other countries entered 11,547 pieces, including fine art and calligraphies, of which 394 were exhibited at the renowned National Art Center, Tokyo, in Minato Ward’s Roppongi district. 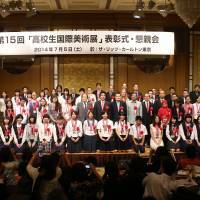 Thirty Japanese students received special awards at the ceremony. 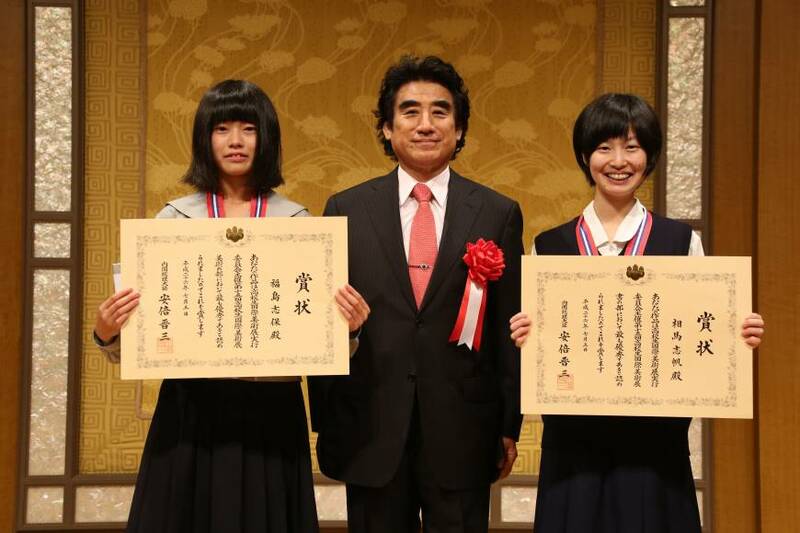 The top Prime Minister Awards went to Shiho Fukushima, a senior at Morioka Daishi High School, Iwate Prefecture, in the fine arts division and Shiho Soma, a senior at Omiya Koryo High School, Saitama Prefecture, won the calligraphy prize. Non-Japanese award winners were also invited to the ceremony, with embassy officials and others handing certificates of merit to high school students from Ireland, the United Kingdom, Israel, Indonesia, Egypt, Cambodia, Singapore, China, the Philippines, Vietnam, Myanmar, Laos and Russia. 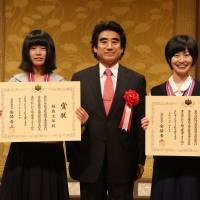 Other prizes include awards from the Minister of Education, Culture, Sports, Science and Technology; Foreign Minister; Tokyo Metropolitan Governor; National High School Calligraphy Association; Japan Association of High School Arts and Crafts Education; Sankei Shimbun; and Mainichi Newspapers. The festival is sponsored by the International High School Arts Festival Organizing Committee and co-sponsored by the International Foundation for Arts and Culture (IFAC). It is supported by the Cultural Affairs Agency, the Ministry of Foreign Affairs, the embassies and friendship associations of the participating countries and Japanese media companies including The Japan times. The festival has three distinct characteristics, said Haruhisa Handa, the chairman of both the festival organizing committee and IFAC. Firstly, in the spirit of nurturing tomorrow’s artists, it is a national exhibition comprised entirely of artwork by high school students, which is open to anyone, and free of charge. Secondly, it does not see high school students as children, but rather as serious artists with untested potential. Thus, awards go to emerging talents, even if it the artists are still a little rough around the edges, rather than established, polished artists. Thirdly, participants are able to experience an international exchange while still in high school, as award-winning participants from overseas are invited to the awards ceremony. Some of the Japanese and foreign high school students are able to take a trip to Hakone every year to enjoy spending time with their newfound friends. “Most importantly, the experience allows students to form international friendships and provides them with an opportunity to expand their views of the world,” Handa said. At the end of the ceremony, Handa, who also runs Misuzu Gakuen, a chain of cram schools that helps high school students prepare for university entrance exams, had some words of wisdom to the participants. While noting that the quality of pieces has been improving every year, Handa stressed the importance of practice and being able to experience an international competition in high school. As a case in point, Handa cited renowned novelist Yukio Mishima who created his first work “Hanazakari no Mori” (Forest full of flowers) when he was 16. Regarding artwork by foreign students, Handa said those from Asia tend to express the social status of their countries. Also, he noted that Asian students tend to use red, yellow and other warm colors, while European students tend to use blue, white and other cold colors. He hopes the students will be inspired by each other’s’ works. Handa hopes more foreign students will participate next year, so they can see and experience art by Japanese and other international students, make friends with peers from many countries and have a memorable experience in Japan with their teachers and parents.